Which broker offers the best forex trading platform UK? Beginner or advanced trader? It doesn’t matter, we got you. We have invested over 150 hours and handpicked the best forex brokers available to traders in the United Kingdom. Your capital will be at risk when using any of the recommended brokers on this page. Never invest money you can’t afford to lose. Using a high leverage can result in big losses. Between 65-89% of retail investors lose money when trading contracts for difference (CFD). Bullmarketz may be compensated by some of the brokers and trading platforms listed on our website. 1. 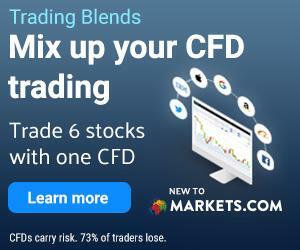 Markets.com – Great platform and selection of currency pairs. Markets.com is a great forex broker for beginners due to the fact that they have a wide selection of currency pairs that you can trade. However, the broker also offers one of the most beginner-friendly platforms for forex and CFD trading. The MetaTrader 5 is a great all-around platform that provides you quick access to any market. Educational Material: eBooks, webinars, videos, articles, and everything else you need to get started. Demo Account: Yes, and it is completely unlimited and free of charge. An excellent UK forex broker that suits beginners. Anyone who knows anything about us should know that we have a weak spot for MetaQuotes software and that is exactly why Trade.com qualifies as one of the top forex brokers in the UK. Besides offering forex trading on MT4, Trade.com gives its users access to the MetaTrader 5 as well as a very fine-tuned and well-designed trading experience. 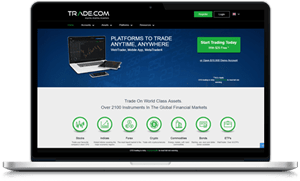 If you need a new broker to trade forex with, we suggest you give Trade.com a try by using their demo account. 3. eToro – Forex Copy Trading that suits beginners. eToro is a great option simply because they are one of the biggest forex brokers out there and they excel in copy trading. Now if you are a beginner, copy trading can be very interesting as it lets you follow and copy other traders. In other words, you can avoid doing all the time-consuming analytic work and start trading right away. 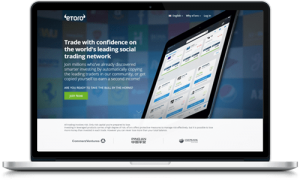 And don’t forget to interact with other traders using the eToro social trading network. Educational Material: There is a lot of material to dig your teeth into but the social network is the best source of knowledge when using eToro. Assets: Forex, stocks, ETFs, cryptocurrencies, you name it and eToro offers it. 4. IG Markets – One of the top dogs, perhaps best for advanced traders. IG Markets is a part of the brand IG Group which is one of the oldest and most well-established financial organizations in the UK. 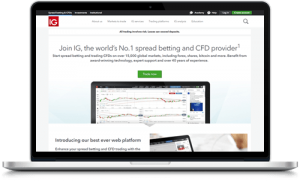 Their flagship product is IG Markets which is a world-leading forex and CFD broker that’s aimed to anyone from a complete beginner to a seasoned professional. Educational Material: IG Markets might very well have the most comprehensive educational material of all forex brokers. Demo Account: Yes! Their demo account can be used to test forex trading, CFD trading, and spread betting. Assets: Over 10,000 underlying assets with currency pairs being the second largest asset class after stocks. 5. Plus500 – Another great Forex Broker with many assets. 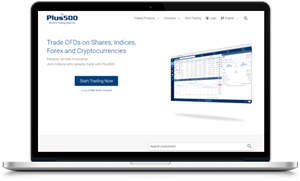 Plus500 is a public company listed in the UK and they are known for delivering a high quality and simple to use the product, especially their in-house designed platform. This makes them a perfect forex broker if you are just starting out. Make use of their free demo account and try trading forex before you deposit any money. Educational Material: Plus500 has put a lot of effort into creating a comprehensive database of educational material for everyone. Demo Account: Yes, you can open a Plus500 demo account today and test their platform out before you start trading for real money. Assets: Forex, stocks, cryptocurrencies, and much more. 6. 24Option – Great educational material and a good platform. 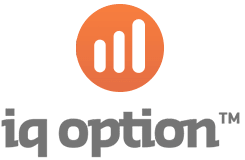 24Option has been around for ages, and recently, they have become experts in forex trading too. What we really like with 24Option is that focus a lot on education, and they give out a free eBook to anyone registering with them. They also hold multiple licenses from CySEC and FCA which means they’re completely safe. Set up a free demo account and try out their platform. Another top FX trading platform for UK traders, also regulated in the United Kingdom and thus safe to trade with. Even better spreads than markets.com and a ton of educational material to help improve your forex trading. One of the best spreads in the industry. 50+ currency pairs including major, minor and exotic forex pairs. Free forex demo account: Yes. 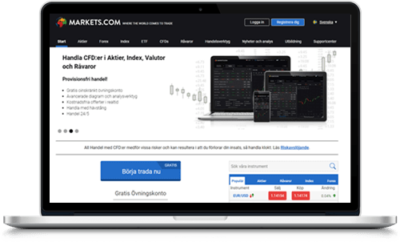 BullMarketz.com provides detailed and constantly updated broker reviews that help people from all over the world find reliable online trading services. All of our recommendations are based on rigorous testing done by a team of professionals and are guaranteed to be unbiased and neutral at all times. To be listed as a forex trading platform on our website the broker has to be regulated and licensed by the FCA or CySEC. What did we look at when we tested these products? We, and pretty much anyone else trading forex on a professional level, have four main requirements for any forex trading platform suitable for beginners. Safety and Transparency – A broker needs to be safe to use and have a license from one of the leading regulatory bodies in the world, for example, FCA in the UK and CySEC for the rest of the European Union. The broker also needs to be transparent with their numbers, intention, and terms. Without this, a broker can’t be considered safe to use and should be avoided. Read more about safety further down on the page. Assets – Without access to the right currency pairs, you won’t be able to trade, and the broker will be useless to you. Therefore, we expect all the top brokers to offer the main currency pairs as well as at least a few minors and a couple of exotic ones. Anything in addition to that is great. Platform – The broker’s platform and software need to be easy to use for beginners. A platform that is too advanced and complicated will make your learning process longer, and it will most likely result in you losing more money than necessary. Therefore, all the brokers listed below have great forex platforms for beginners. In addition to these three requirements, we look at other factors too. For example, as a beginner, it’s especially important that the broker has good customer service and great educational material. Another equally important factor to consider is regulation and licenses. A broker operating in the UK needs an FCA license (Financial conduct authority). Without such a license, a broker cannot legally accept UK based clients. Therefore the first thing you need to do is to make sure that the broker is regulated by the FCA. Not anyone can just launch a broker in the UK and start accepting forex traders. All brokers operating their business in the UK will need to have a license from FCA. Financial conduct authority. Getting an FCA license is not easy, your product and trading conditions need to be of the highest quality. It is crucial that the broker you choose is regulated and licensed by the FCA, otherwise, you are likely dealing with a scam or illegitimate broker. Forex trading is associated with high risk, but all risks can be managed. Trading with an unregulated broker introduces a very high risk. If you look around the web you will be able to find a lot of unregulated brokers and scams. You don’t want to be associated with unregulated brokers. As an example, a broker regulated by the FCA, but not following the minimum requirements set by the FCA, will be fined. Or even worse, might lose their license. An unregulated broker operates without the insight of the FCA and they can pretty much do whatever they want with your money. Freeze the account, manipulate the market or even worse, cease to exist. The FCA (Financial Conduct Authority) is a financial regulatory in the UK, they are operating their business independent from the United Kingdom Government. The FCAs main purpose is to enforce regulation and provide licenses to financial firms. The FCA regulates these financial firms to provide safety and maintain a good climate in the financial markets in the UK. The FCA was previously called FSA. The FCA is a big reason why many of these FX companies have offices in London. In fact, the FCA themselves have their headquarters in London. The FCA has the power to regulate conduct related to marketing for trading platforms and currency brokers such as Plus500 and eToro. They are responsible for setting the trading conditions and minimum requirements of the brokers. As an example, they have prohibited bonus payouts and regulated how the brokers are allowing to do marketing. The bonus was simply a way to attract new traders, once they accepted the bonus it came attached with impossible turnover requirements. It made little sense to allow it. Another way they have taken action is that all marketing needs to come with a risk warning attached. “You capital is at risk” or similar. The FCAs main purpose is to protect the traders in the United Kingdom. Are you still with us? We have gone through the best forex brokers and forex trading platforms, now its time to look at how you maximize each broker and get the most out of them. Forex is short for Foreign Exchange or the Foreign Currency Exchange, and it’s a market where people trade currencies. The forex market also happens to be the single biggest market in the world with a daily turn over of several hundred billion dollars. The reason for this is that central banks and other major entities trade currencies on a large scale to help stabilize our world economy. Despite the market’s enormous size, you as a private trader can trade currencies using much smaller amounts, and that is one of the main reasons why forex trading is so popular. Currencies are always traded in pairs, called currency pairs, and since currencies usually don’t change that much in value over short periods of times, leverage is used whenever you open a position. Leverage helps increase your exposure on every position so that you can benefit from even the smallest market movements. To learn more about forex trading and all of its benefits, we suggest you check out our comprehensive forex trading guides. We have also written guides about the perks and downsides of leverage trading which contains essential information. Finding a forex broker that’s good for a beginner is not only necessary but crucial if you want to get started trading forex with the best potential opportunities. So let’s just pick the best and most recommended forex broker, right? Well, it’s not really as easy as that, and the most recommended broker is often a fairly advanced broker which would work for most people. However, if you have never traded forex before, you want to find yourself a broker that is easy to use with a set of essential and useful tools for beginners. But what exactly is it you’re looking for? Let us show you and try to explain what you as a new forex trader needs. The following checklist should be used to find the best forex platform for beginners. Remember that these are the most basic and essential features that you need to be looking for and that any additional features can be considered a bonus that makes the forex broker even better. The checklist has been completed with the help of this list of forex brokers. Make sure that the forex broker you are about to register with is licensed or say goodbye to your own safety. Using forex brokers with a license is important because it means the broker has to follow very strict guidelines and rules. It also means that they are subject to regular audits and that they must protect their customers at all costs. This goes hand in hand with the first point. Always make sure that the broker uses the latest and most updated safety features to help protect you and your funds. That means top shelf encryption, separating business funds from clients funds, regular updates, and a good reputation for being serious. This step is equally as important as the first two points on the list, however, it also requires more time to check. Making sure that the forex broker you’re interested in is a good fit includes reading up about the platform to make sure it suits your needs. Finding a good forex platform for beginners isn’t very hard at all, and we suggest you start by taking a look at the MetaTrader 4. Okay, so you’ve found yourself a safe and regulated broker with a platform you like, now you have to make sure that broker offers the instruments you’re interested in. All of the top forex brokers for beginners offer at least 35 currency pairs. Before you register, deposit money, and start trading, we advise you to test the broker out. The best way to do so is to open a demo account and trade forex using virtual money. A demo account provides a risk-free environment where you can practice trading as a beginner, but it also offers benefits for more experienced traders. As a new forex trader, you’re probably not ready to deposit $10,000 and start trading with the highest available leverage. In fact, you shouldn’t start trading like that. Instead, you should deposit smaller amounts and take it easy in the beginning. Because of that, you need to find a broker that allows for smaller minimum deposits and limited leverage. If a broker’s limits are very high, they are most likely targeting professionals and should be avoided by beginners. It’s basically impossible to learn how to trade on your own, and you will have to study strategies, economic systems, patterns, and candlestick charts. Naturally, you can find a lot of this information available online but for your own convenience, you want your broker to provide some too. In addition, having a strong educational program proves that a broker is dedicated to helping their customers. At this point in your evaluation process, you want to see if the broker offers any additional perks for beginners. Are there any attractive incentives that separate the broker from others? For example, do you get access to a personal account manager, or is there any campaign that you can partake in? Maybe you can invite your friends and gain credit for every registration. Lastly, you want to ensure that you’ve found a broker that you can grow with and that not only caters to beginners but also to more experienced traders. You see, at some point, you will no longer be a beginner but a more experienced trader, and you don’t want to be forced to switch brokers because the one you originally picked can’t support professionals. By using the steps provided on this page, you will be able to find a good and suitable forex broker in no time. Just remember that decision is a personal one in the end and that you shouldn’t let others influence you too much. As long as the broker is licensed and safe and you feel that you like their features and instruments, you will have a good experience learning how to trade forex. Does forex trading sound a bit scary and complex? Don’t worry, you can always get started with a demo account before you make any real money deposits. This will allow you to try out the platform before you risk losing any capital. The best fx trading platforms, such as InstaForex, are all offering great demo accounts. It lets you test the platform, this way, you will know if you like the product or not. It’s a great way to get familiar with forex trading, especially if you are a beginner or if you haven’t even tried forex trading before. You get to try multiple brokers, for free. The registration process is much shorter if you only sign up for a demo account. As mentioned, safety is our number one concern when recommending brokers to you or using brokers on our own. For forex traders in the UK, the most important part of any broker is that they are regulated by the Financial Conduct Authority (FCA) or the Cyprus Securities and Exchange Commission (CySEC). If a broker has a license from any of those two entities you can rest assured that it’s a safe and reliable broker. Any UK Forex Brokers who are not regulated should be avoided. Moreover, we suggest you read our reviews where we share our personal opinions on the brokers as well as check forums and other review sites to see what others think. You should only sign up for a forex account after you’ve thoroughly evaluated a broker and can assure yourself they are safe to trade with. Besides the brokers listed above, there is a sea of other brokers offering forex on the UK market. And plenty of good alternatives too, just make sure that the broker has a license from FCA, the financial authority in the United Kingdom. Any broker accepting UK customers without this license is most likely a scam. An FCA license is a requirement for any broker who wants to operate in the UK. Leverage and margin is a service that forex brokers offer to their clients and without it, it would be impossible to make a profit from the forex market. A margin is a loan that brokers offer to give you leverage in your trade. By multiplying your invested amount, the broker increases your exposure to each position which maximizes your potential profit while it also increases the risk. Using leverage is essential in forex trading since currency pairs never move a lot and without leverage, you would need to invest huge amounts of money on your own. Maximum leverage offered by regulated brokers for retail traders is 30:1. Knowing about the risks of trading is only one part of staying safe while trading forex. In order to keep yourself and your capital safe, you need to practice money management, and you need to actively avoid the risks of trading. You also need to understand that most of the risks of trading are mental. In other words, it’s you and your own mind that poses the biggest risk of them all. 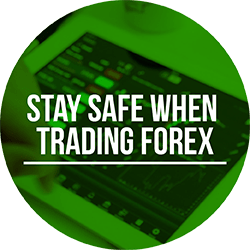 Just because you’ve found and registered an account with a safe and regulated forex broker doesn’t mean that you’re safe. In fact, you will always run the risk of losing money, placing bad trades, and even miscalculating charts and making faulty predictions. As many as 85% of all traders lose money when trading forex, it’s something we all have to accept. That being said, there are ways to minimize the risks, and we’ll offer you some tips on this page. In terms of risk managing strategies for forex trading, nothing is more effective than good money management. Money management is a rather broad subject that includes different techniques and strategies, and as the name entails, your goal is to manage your money in a correct and safe manner. The first step to good money management and something all traders have to master is setting a budget and sticking to it. Before you start trading, you need to evaluate your economic situation and calculate how much money you have to trade with. You see, the money you trade for can never be funds that you need for something else. Trading should be your last economic priority. That means you have to separate the money you need to live; rent and mortgages, food, insurance, savings, retirement funds, etc. from the money you trade with. After you’ve set a budget, it is advisable that you break the budget down into segments. For example, if you have $4,000 to trade with during a month you should split it up to $1,000 per week, $140 per day, and so forth. It’s up to you to decide what kind of budget you want to follow, but it’s important that you do actually do it. There is a high risk of losing control when trading without a budget. And don’t forget that having a budget is a non-negotiable meaning you have to always stick to it no matter what. We even advise you to withdraw your profits instead of reinvesting them to avoid blurring the lines of your budget. Never chase your losses – Every trader will lose money at some point, and whenever that happens to you, you should cut your losses and start over, preferably with a new instrument. If you try to win back your losses, you will most likely lose more money and that’s a dangerous spiral that you don’t want to get stuck in. Use stop-loss – Every position you ever open needs to be planned in advance. That includes setting stop-losses both at a high and low price. The high price represents at which price you want to sell the instrument and pocket the profits while the low price represents the price at which you want to cut your losses. Cut your losses when needed – There will be situations when you have to cut your losses and walk away. It’s as simple as that. In addition to the brokers provided above, we have listed the best trading products based on many other criteria in order to accommodate as many traders as possible. Best forex trading app UK we focus our attention on everything revolving mobile forex trading apps. Today, all the top brokers offer mobile trading apps, but only a few of them have managed to develop mobile software that is good enough to be considered the best. Naturally, we have tested them all and shared our opinions with you. Best Trading App – Looking for a trading app that offers all kinds of assets? Best Trading Platform UK – Want to trade other assets as well? 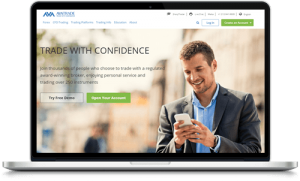 Crypto Brokers UK – Want to trade Bitcoin? In addition to everything we’ve mentioned on this page, we want to offer a few well-needed tips for any beginner. The most important is to take it easy, to begin with. After you’ve found yourself a good forex broker, we suggest you start off with a demo account. Whenever you start feeling comfortable with the demo trading we recommend you move on to depositing a smaller amount of money. Don’t put yourself in unnecessary risk and make sure you learn the necessary skills and you’ll be trading like a professional before you know it. Also, never invest money you can’t lose, even with the best forex brokers in the UK. And never, ever chase your losses. Losses are something that happens to everyone and something that you have to accept. How come you don’t list more brokers? I know for sure there are many more brokers in the UK.. The reason for the article is to provide our visitors with absolute best forex brokers available in the UK, not all forex brokers in the UK. These are our favorite brokers. Though you are most definitely right, there is a ton of other brokers out there. Regulated and unregulated. We always advise our users to use regulated forex brokers. If you feel the none of the forex brokers listed above are not suitable, you can always look for others. So I am looking for the best currency / forex trading platform.. I do not really care about the design etc.. just great functionality and performance.. I am curious about how these brokers are making money? Hi Kassy, thanks for your comment. Question 1: The best platform – We would suggest that you check out Avatrade, or any other broker offering MT4 or MT5, these are generally considered to be the best forex trading platforms if you are only looking for performance and don’t care too much about design. Question 2: All of the forex brokers listed here are making money with a so-called spread. and it’s basically the difference between ASK and BID. You can look at the spread as the broker’s service cost.